Myrrh Incense Sticks are made from resin and natural gum extracted from myrrh trees which are low thorny shrubs which grow in rocky terrain. "Myrrh" is basically dried oleo gum resin that is waxy and brittle when in tree and, but when collected in the bales, it becomes hard and dry. Myrrh Incense Sticks are widely used in religious rituals since the time of ancient Egyptians. However, it also finds great medicinal value. We have blend this Myrrh with a variety of combustible materials to come up with an innovative range of myrrh scented incense sticks. When a myrrh tree is wonded it bleeds a resin which coagulates fast. This resin or gum is used to make myrrh incense sticks as well as myrrh oil, scent and perfumes. As the materials are eco-friendly you can enjoy its fragrance till the last breath. However, other than for religious customs, it is widely used in therapeutic centers, spas, and many aromatherapy institutions. 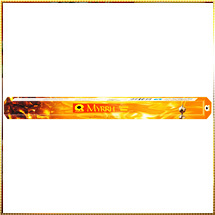 Our Myrrh Flavored Incense Sticks are available at reasonable cost and comes in attractive packagings.